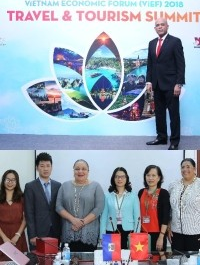 Wednesday in Hanoi (capital of Vietnam) former President Michel Joseph Martelly intervened at the Tourism Summit of the Vietnam Economic Forum (VIEF2018) in front of a very select audience of investors and tour operators where he promoted Haiti with passion, inviting Vietnamese investors to seize the opportunities in Haiti. “[…] Between countries who believe in their beautiful culture, who believe in themselves and both of whom are destined to be gateways who in the Caribbean who in Southeast Asia, Gateway to a planned tourism because part of a strategic development policy. The day before, the Martelly couple’s Rose et Blanc Foundation (FREB) officially became a member of the network of 100+ collaborators of the National University of Agriculture of Vietnam (VNUA), following the signature between Sophia Martelly, President FREB of a memorandum of understanding of cooperation with the VNUA and the professor Nguyen Thi Lan President of the University. As part of this cooperation, the two parties will set up a scholarship program and a short-term training program for students in the agricultural sector, with the support of the Haitian private sector and the private sector in Vietnam.